The Online Edition contains just a sampling of all the news in the print edition. Subscribe today! Shirleen Jim and her father-in-law Frank Jim. 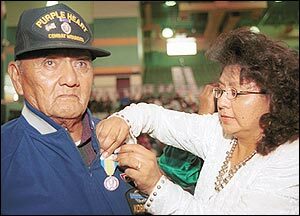 TUBA CITY (Nov. 15, 2001) - Snuggled safely under her left arm, Mary R. Begay embraced an American flag that was presented to her 16 years ago when her husband, a military veteran, died. The 71-year-old Begay brings out the flag only on special occasions. Two days before Veterans Day, it was one of those special days when she traveled nearly 200 miles from her home in Iyanbito, N.M., located in the Eastern Agency, to Tuba City, on the western end of the Navajo Nation. Friday, Nov. 9, at the Tuba City High School pavilion was a day no different than any other except that it was a cool, autumn day where Begay's late husband, John Nez Begay, was being honored for serving his country during the Korean War. ABOVE Korean War veteran Piasso Narciso of Alamo, N.M., accepts a handshake from Lt. Col. Hanbin Park, Korean Liaison Officer, after receiving his medal. 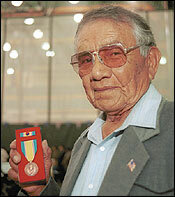 RIGHT Harry Nez of Tuba City shows off his medal. It was also a day that military and private citizens from the Republic of Korea were on hand to see 86 Navajo men and widows receive the Republic of Korea War Service Medal bestowed upon American soldiers by the Korean government over 50 years ago. It is the only medal from the Korean War that is recognized by a government other than the United States. "I feel sad," Begay said, as she held back tears with a swipe of her right hand. "I feel sad about it because I wish he was still alive. I feel like crying. I just held it back but my tears will still come out." The Republic of Korea originally offered the medal in 1951 to the United Nations' forces "to express the heartfelt appreciation" of fighting for democracy against a communist force. But because of an oversight by the U.S. government, the offer was forgotten only to be detected two years ago. For those men who fought in the Korean War, it does feel at times that they are the "forgotten warriors," as described by a speaker. "This is a recognition that was overdue," said Donald Bitsilly, 66, of Greasewood Springs, Ariz. "Even in our own chapters, we are hardly recognized - and then it's only at this time of the year (Veterans Day) they recognize us." As a way to commemorate the 50th anniversary of the war, the U.S. and Korean governments are conducting ceremonies across the country where the medal would be presented to veterans who served in the three-year conflict. Approximately 1.8 million veterans across the country are eligible for the medal. The Navajo Nation Veterans Affairs Department submitted 671 names but the U.S. Department of Defense approved only 155. More veterans could be honored if they meet the medals' criteria, veterans' affairs office director Leo Chischilly said. Jimmy Chee, 69, of Page, Ariz., didn't care why the medal was being presented, he was just grateful that the Korean government sent a contingent of its citizens to honor him and his fellow veterans. "I'm really appreciative," Chee said. "I'm glad all these Korean people came over here." Chischilly said a main reason that Korean dignitaries made the trip to Tuba City is because the tribe has a large number of Korean War veterans and is a member of the 50th anniversary commemoration committee. "It was pretty exciting to know that there are a lot of veterans who are from the Navajo Nation," said Korean Consulate General Public Relations Consul Seok Joong Yoon. "This is a very meaningful occasion. This is probably one of the most concentrated areas of veterans living in one place." In order to be eligible to receive the medal, a person must have served between June 25, 1950 and July 27, 1953; been on permanent assignment or on temporary duty for 30 consecutive days or 60 nonconsecutive days; and performed their duty within Korean territorial limits or support of actual combat operations. Retired U.S. Air Force Gen. Nels Running said Navajo men and women have a reputation of answering the call when the country needs them. He said the world, not only Korea, has much to thank for the DinŽ in providing freedom. "Here on the Navajo Nation, you are rich with traditions, some of the strongest traditions," Running said. "So strong that when you answered the call of the United Nations and America, you went to a country and people you did not know. The Republic of Korea would not exist today if you did not answer the call." He added that the Navajo Code Talkers who served in World War II are further examples of that "demonstration of heroism of this generation of Navajo warriors." During the three-and-a-half hour ceremony, a Korean dancing group performed songs and dances. As a bouquet of balloons was presented from the dancers to the veterans, a recorded voice expressed the Korean sentiment. "In honoring this gift of peace," the voice said, "we're honoring not a Christian God, or a Buddhist God, or an Islamic God or a Jewish God, but a God of all humanity. Not a Christian peace, but a human peace for all of us humans. Like a nation cannot be bigger than the Earth itself, we are all one ... Before we are Indians, before we are Koreans, before any other race, God made the Earth. We have to realize we are of the Earth." The dancing troupe then performed several more dances and a drum presentation. Describing his age as around 74, Lawrence Thomas of Indian Wells, Ariz., was appreciative of the medal but it was knowing that his fellow Korean veterans were being recognized that made the trip worthwhile. 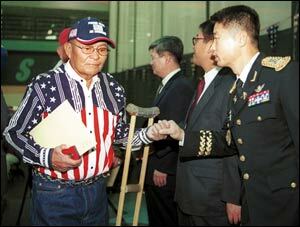 He began receiving his military pension 43 years after being discharged because he had other concerns. "I forgot all about myself. I just want to help the people, that's all," said the former Post 71 American Legion District 6 vice commander. "I didn't think of receiving anything (today), the only thing on my mind was to eat." Aaron Trujillo, 71, of Nageezi, N.M., added the Korean War service medal to his already impressive collection of military medals including the Bronze Medal, Purple Heart, Infantry Combat Badge, Service Medal and Campaign Medal, which was presented five times for the five major battles he was involved in. Piasso Narciso, 70, of Alamo, N.M., who speaks limited English, called the commemoration ceremony "wonderful." He and his family made the 325-mile one-way trip the day before. He thanked the Republic of Korea government for remembering the men who fought and lost their lives defending South Korea from the communist North Korean forces. Several dignitaries were invited to the ceremony but the only one who attended in person was President Kelsey Begaye. A Vietnam veteran, he thanked the men for their sacrifice. "We must not forget that the freedom we have is not free," Begaye said. "Many generations will benefit from your commitment." Surviving family members can receive the medal for deceased eligible veterans. Combat nurses who treated patients wounded in combat are also eligible. Information: Navajo Nation Veterans Affairs Office, at 928-729-4010 in Fort Defiance, 928-674-2224 in Chinle, 505-786-2030 in Crownpoint, 505-368-1013 in Shiprock, 928-283-3029 in Tuba City or 928-871-6413 in Window Rock. As Mary Begay cuddled the American flag, she proudly displayed the newest collection of military accolades her late husband earned. She briefly showed off the medal with family members and then sat down holding the flag that brings pride knowing her husband defended his country. "It makes me feel strong when the wind waves it. I will never forget ... ," she said, unable to finish. And like the retiring of the colors by the Luke Air Force Base Color Guard, she quietly exited the gym feeling proud of her late husband's place in American history.